I hope everyone is having a great Labor Day weekend! I can’t wait for tonights game. 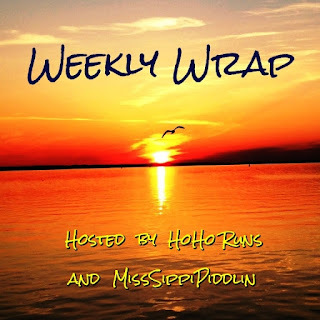 Today, I am linking up again for weekly wrap, hosted by HoHo Runs and MissSippiPiddlin’. Tuesday – Cross train. Jillian Michaels 30 Day Shred level two workout. Wednesday – 3 mile run. I headed over to the state park trail after work and did four hill repeats with a 1 mile warm up and roughly 1 mile cool down. Friday – 7 mile run. I chose to do my long run on Friday morning, since I am off work on Fridays. I did this run over on the Huckleberry Trail so that my run would be on rolling hills. The new part of the trail has a few hills that are pretty big! Pictures never capture it, but trust me the hill pictured below is a big one. Saturday – 3 mile run. Just an easy run at a nearby park, breaking in a new pair of shoes that I bought on Friday (more on that sometime in the near future…). Sunday – 6 mile run. Debbie and her husband, Bill, were driving through my neck of the woods and decided to stop in so we could meet up for a run. Debbie and I got to run together, and I got to show them ‘my’ trail. It’s neat getting to share a place you run all of the time with others! Debbie had her trusty, and very cool, GoPro with her, so we got some action shots toward the end of our run. Thanks for the picture, Deb! Total Miles: 19 miles. This weekend I started cutting my mileage back in preparation for the Hokie Half Marathon. Sometimes I think we feel worse when we start cutting our mileage back, but it’s usually just our body recovering and getting ready for race day. Fingers crossed the last of this summer humidity moves out and the fall weather gets here soon! Do you have a long weekend for Labor Day? What did you do this weekend? Is it starting to look/feel like fall where you live? What a pretty place to run!!! Looks like a good week for you. Enjoy your taper and let your body absorb and recover from all that training. I’ve been trying to do just that! I hate how a lot of times during taper you feel more tired and sore than you were during training. Those trails look great. I wish more places had trails so I wouldn’t have to run on the roads. I used to run on roads a lot, and I hated having to jump in the ditch everytime a car came by and dealing with loose, unfriendly dogs. LOL. Hills never look big in pictures! I wish I had some nice trails like that around here. I’ve been playing with my GoPro, but mostly for video. It’s nice you were able to run with Deb. Enjoy your taper week. It feels funny not to run your normal schedule, but your body will definitely appreciate it. Good luck in the Hokie Half marathon. I hope the ballgame goes your way tonight and thanks for linking up with us today! I found the GoPro a bit weird to use – I think it must take some time to get used to. Debbie is really good at it, though, and she gets such neat shots! It LOOKS like fall here, but it sure doesn’t feel like it! I don’t work, so today is same old, same old except my husband is off. But I’m lucky that I can somewhat move my long runs around when need be. Cool to be able to meet up with someone AND run with them. I hope it starts feeling like fall soon! Time for the summer heat to pack its bags. Ha! I’m in Miami so it is not starting to feel like fall … we don’t really have fall, sadly. I attempted an open water swim in the ocean but it was filled with moon jellies and so I bailed. Bummer but it is what it is. I feel like the last kid on the block to get a toy. I totally want a go pro. We are getting one (hopefully last) blast of heat and humidity. The trees are getting brown because it has been extremely dry this summer, but no pretty colors as of yet. Have a great week! I hope you get your Go Pro! Debbie gets such neat pictures with hers. And I hope that blast of humidity is gone and you’re getting some nicer fall temp’s now! Great job last week! The Huckleberry trail looks like a nice one. Hills are always a great workout. Hope you had a great Labor Day! The Huckleberry Trail is where I ran when I first started running, and I ran there throughout college, so it’s always enjoyable to go back! Uh yes, that hill looks huge! Sounds like you had a great running week, good luck on your half marathon! Well I’m glad it showed in the picture! How fun is that you get to show Debi where you run! Yup I so want a GoPro! Those shots look neat! I’m playing catch up after my half marathon this weekend and getting in late from a long weekend! Thank you for linking up with us this week! I do hope you have a great week! GoPro’s are very popular, and I can definitely see why. People get such neat pictures with them! Great pictures! Hills never photograph as big as they are. Too bad our butts didn’t have the same problem. LOL!! It was great seeing you and running with you on Sunday. Thanks for showing us your trail! I cheered extra, extra loudly for you last night, but apparently not loudly enough. Despite not getting the upset, Bill and I had a great weekend. I’m glad y’all had a great weekend! You had a lot of fun stuff going on. I so wish we had beaten Ohio State, bah! P.S. Now that I’ve run/walked the new part of the Huckleberry Trail, I can attest to those hills being steeper than they look in your picture!